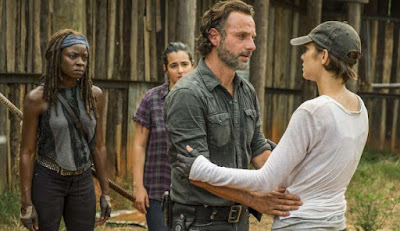 Thinking AMC's The Walking Dead is limping along on its last legs, especially with next season's departures of Andrew Lincoln and Lauren Cohan? Think again, because the franchise is actually growing, and reaching out into other arenas beyond the small screen. AMC CEO Josh Sapan recently said a plan was in place for the next decade's worth of The Walking Dead, and now thanks to Bloomberg we have an idea of what they have in store. None of it should come as any surprise. While the O.G. series will keep on rolling, along with spinoff Fear the Walking Dead, AMC also will produce "multiple movies and new TV shows". These films are being developed in the hopes they will then lead to other TV series, with the expectation that at least one spinoff will be set outside of North America. Yep, The Walking Dead is going global. These projects would be hugely expensive, approximately costing in the hundreds of millions of dollars. That's a lot for the tight-budgeted AMC to handle, so they're looking to possibly partner up with other media companies, which could mean bringing these projects to a streaming service like Netflix who could shoulder the costs and increase viewership. Scott Gimple, longtime producer, writer, and showrunner, will oversee all of these new projects. At this point is there really a demand for more of The Walking Dead, though? Ratings have been sliding and the loss of such fan-favorite characters is going to deal a big blow. Sure, these would basically be brand new projects but there's the risk of diluting the brand. AMC has to do whatever they feel is necessary to keep their most profitable franchise alive, though, so let's see where this goes.